Model School Program – Schoolwide, Inc. The Schoolwide, Inc. Model Schools Program identifies schools that exhibit a shared vision for literacy instruction; are committed to excellence and research-based strategies within a balanced literacy framework; and are dedicated to using data and assessment to analyze growth, inform instruction, and drive integrated decision making. Schoolwide Model Schools value forming partnerships that help create and sustain a collaborative community and demonstrate a willingness to share their experiences with fellow educators from neighboring schools. Selection as a Schoolwide Model School celebrates and affirms the hard work of students, educators, and administrators. Schoolwide Model Schools are both an inspiration and a powerful resource for schools and educators seeking to transform or improve their literacy instruction. Butler School District 53 is an acclaimed school district in Oak Brook, Illinois. It serves a little over 500 students together at Brook Forest (grades K–5) and Butler Junior High (grades 6–8). Butler District 53 is known for its high academic achievement, nurturing community, and personalized learning opportunities; partnering with Schoolwide has only furthered that reputation. With the help of a Schoolwide partnership, Butler has developed a strong culture that promotes responsive literacy teaching and learning, and the development of individual readers and writers. Neighboring schools continue to visit this child-centered environment, where they see and hear teachers and students question, research, read, write, and think as literate individuals and as a community of learners. VISIT: To schedule a tour of Butler School District 53, please contact Kelley Young, Vice President, Schoolwide, Inc. Located along the Hudson River, this Bergen County NJ school district has been a partner with Schoolwide for seven years. Cliffside Park is committed to ongoing professional learning that is student driven, includes both teachers and administrators, and values reflection and collaboration. Schoolwide’s partnership with CP began with a small pilot in which second- and third-grade teachers would implement Writing Fundamentals Units of Study to raise the quality of student writing. Since then, Cliffside Park Elementary Schools have expanded their professional learning experiences with Schoolwide to reading workshop, teaching grammar within the context of real reading and writing, and responsive small-group and individual instruction across grades K–6. Holding the distinction of being our first Model School district, the teachers, administrators, and students of Cliffside Park have repeatedly demonstrated a zest for teaching and learning. The ongoing professional learning that Schoolwide has provided over the past seven years allowed teachers to develop their craft in a differentiated setting, while also celebrating the continuous growth of students as readers and writers along the way. Neighboring districts continue to visit this student-centered setting, allowing them to witness firsthand all the possibilities that workshop teaching, ongoing professional learning, and sustaining a partnership can afford. Evergreen Park Elementary School District 124 includes five schools: four elementary schools (serving grades K–5), and one middle school. The approximately 1800 students that attend the schools of Evergreen Park are exposed to innovative, standards-based learning opportunities daily. Partnering with Schoolwide over the past four years, Evergreen Park Schools have transformed their literacy curriculum and instructional practices by moving to a Balanced Literacy Framework using Schoolwide’s Reading and Writing Units of Study. Visiting educators will see classroom environments that reflect the thoughts, ideas, questions, and research of individual learners who are part of a collaborative community of readers and writers. The staff has invested their time and effort in ongoing professional learning experiences through a combination of teacher workshops, demonstration teaching, staff meetings, and co-teaching with Schoolwide consultants, as well as consistent in-district coaching, modeling, and collaborative planning to support systemic change and growth. Finley Junior High was a recent addition to our Model Schools program, celebrating all the gains that the classroom teachers and students demonstrated in grades 6–8. This junior high school setting offers a well-rounded educational program that assists students in developing the skills necessary to meet the educational challenges they need to be prepared for the 21st century. 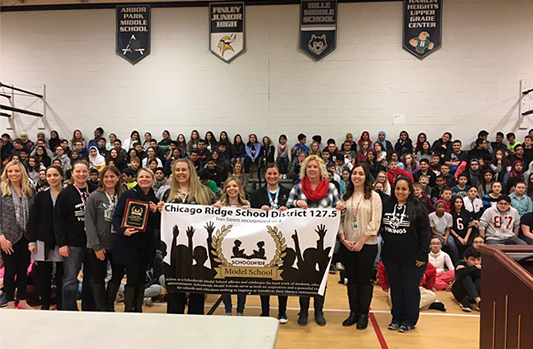 Over the past three years, Schoolwide has partnered with Chicago Ridge Schools to examine their instructional practices in literacy while identifying resources that will support their students’ growth as self-directed, motivated readers and writers. Throughout the professional learning process and implementation of Schoolwide’s Fundamentals Units of Study, both teachers and students have transformed their own reading and writing identities and have developed the confidence needed to problem-solve, compose, and communicate effectively. Visitors from neighboring districts experience what it feels like to be immersed in a workshop setting with adolescent learners who understand what it means to be independent readers and writers. Visitors also enjoy meeting with teachers and administrators to learn about their journey and positive changes that have occurred in their junior high school.